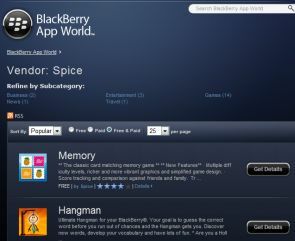 Research In Motion has announced that mobile application developer Spice Labs has registered a total of 10 million downloads on the Blackberry application store. Spice Labs offers 21 free and paid applications under various categories such as casual games, learning, news and travel. In a statement, Samir Gulve, Joint Managing Director, Spice Mobility said, "We are delighted to be the best online casino first Indian company to achieve this milestone within BlackBerry App World and are thankful to RIM for the tremendous support they have provided along the way. This achievement is a validation of our team's conviction and a testimony to the fact that one can develop Mobile applications for global audiences from India." Spice Labs offers apps for J2ME, Symbian, BlackBerry and Windows Mobile platforms. It is promoted by Spice Group.